CarPlay will be accessible through Toyota's standard Entune 3.0 multimedia system alongside Android Auto and Amazon Alexa. 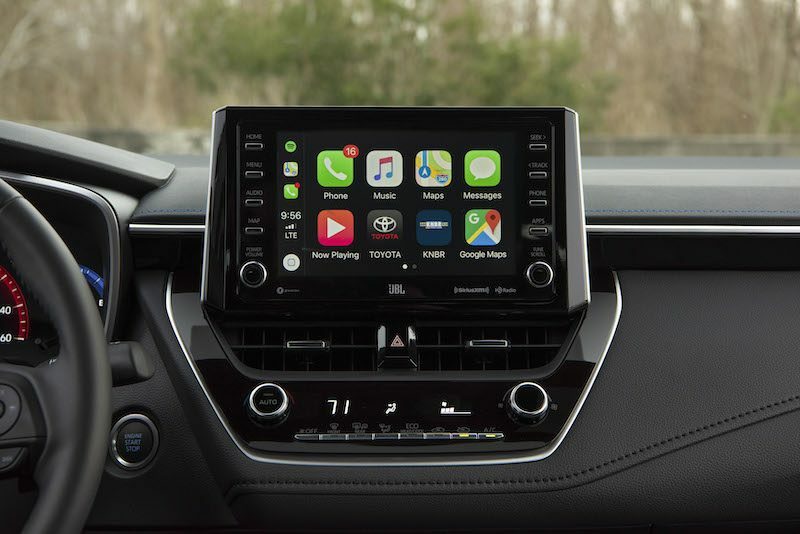 The base model 2020 Corolla is equipped with a 7-inch touchscreen, while the LE trim and above feature a larger 8-inch display. All models use wired CarPlay via USB ports. Toyota says the 2020 Corolla will be available at dealerships this March, starting at $19,500 in the United States. Toyota was a longtime CarPlay holdout, but it now offers Apple's platform in the 2019 and later Avalon, Camry, Corolla Hatchback, C-HR, RAV4, and Sienna as well as the 2020 Corolla, Tacoma, Tundra, Sequoia, 4Runner, and Supra. Read our review of CarPlay in the 2019 Avalon and 2019 Corolla Hatchback. They all eventually cave, just like Apple Pay. A $19,500 Corolla. Welcome to the future. I guess relative to most new cars (I think ASP of USA new car sales in 2018 was like $37,000), the Corolla is still a bargain but 20K for a Corolla seems like a practical joke. Pickup buyers in the US are paying 61% more than 10 years ago. CarPlay is nice, but without wireless, to me it’s useless. I would rather go aftermarket since they now offer wireless CarPlay. Wow, useless? I would think it would have some utility, like playing music, provide directions, and since it's wired it would also charge your phone while you do all that. It may only be me but I think their implementation looks pretty ugly. if you want to go aftermarket, my recommendation is to avoid Toyota. their headunits are too tightly integrated to the dash and cars electronics they're not easily replaced.. but this has been a trend for most manu's so i dunno what else is an option. the pricing of these new cars is insanity. I bought a 2012 SE 4cyl fully loaded, with financing for approximately 22k USD. brand new in 2012.
my dealership keeps sending me letters claiming that my car is prime for trade in because they have massive interest in cars of mine age, and mileage (60,000km's). So I went in to find out what it would get me into. for $400 (CAD) / month for 4 years, I can trade up into a 2018 Corolla LE! Nevermind THATS EXACTLY WHAT I WAS PAYING FOR A CAMRY! these price increases have been absolutely ludicrous in the car market. I can't even imagine what they are right now with all the trade kerfuffles going on . But I can assure that Toyota's current pricing is not going to convince me to get another one. I've priced out some of the competition. For nearly the same price as that LE Corolla, I can get a fully loaded Mazda 3 sport GT with AWD. i'm approaching 8 years on my Camry and sure feeling the itch to get something new. But i'm a cheap miser and if you want me to spend the money, I need to feel like the value's justified. Toyotas no longer doing that. Will this work in my 1997 Corolla? I don't know why anyone would rely 100% on wireless CarPlay. Eats up your battery reeaaalll fast. I would trust my old Lightning USB cable over wireless Carplay and charging. You're in a walking car, the slightest bump can mess up with wireless charging. Two hours drive and I'd end up with 5% battery because of interrupted wireless charging. If I can go wired, I would. Just like my house are connected with 10Gbps LAN throughout every room. BMW's cars (the only ones who seem to offer this wild Wireless Carplay option) do have USB ports. You are not forced to use it without wires. You can plug it in. They even offer docks inside the armrest if you prefer it as a plug in option. A lot of people don't always drive 2 hours but 30 minutes or less. They would prefer don't having to think about anything (like today to make calls) and battery won't suffer because there isn't enough time for that. Perhaps BMW understands that better being from Europe were distances are small. This seems like the audio jack nonsense of having to remove it to use Bluetooth headphones. If you plug your phone in when it is at 100% it won't charge... not sure what the big deal is. I don't get the hangup with wired vs wireless carplay. Half the time I'm using carplay I'm also using GPS, which is going to put a drain on your battery - so I want it to have a power source. It's going to be using even more power to transmit all the carplay data wirelessly. Yes, I know there is wireless charging. Wireless charging + GPS + transmitting carplay data = really warm/hot phone. Is it really that hard to just plug in one cable? Someone on here refuses to use it because it isn't wireless? That's crazy. It's not like you're moving all over while you're sitting in your car and the cord is going to get in the way. My experience with wireless carplay on my Pioneer unit over the past 6 months is that using GPS navigation causes negligible battery drain. When using the phone standalone for navigation, sure, the screen stays on and that can chew through battery but with carplay the phone screen stays off. Yeah I can see wanting to plug in my phone to charge if I'm going on an extended trip but If I'm using it on something like a 2-hour trip or around town and use navigation I'll just leave my phone in my pocket and it's never an issue. I don't see not having wireless carplay as a deal breaker but it's certainly nice to just get in the car and go without thinking to plug in the phone. Lol isn’t just about every issue on this site one?